Dive Journal: Our last dive in Kosrae, for this year anyway! 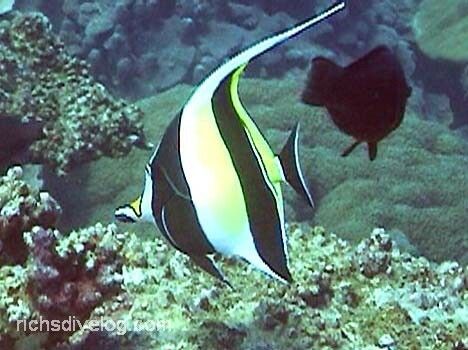 A fast group of curious black jack trevallys circles us early in the dive, and we also encounter a menacing titan triggerfish. As I am shooting video, the controls seem to stick, and I unfortunately spend a portion of my dive time trying to remedy the problem. Seems that when I reassembled the video rig after shooting some video during our lunch break, I have not inserted the digital I/O jack quite all the way back into the camcorder. I can still power up and power down the camera, but the record and zoom buttons no longer operate consistently. Just as well. Linda and I pair up closer and enjoy the remaining minutes in the water together. There is a nice friendly scrawled filefish that approaches us. Katrina later calls him one of the stupidest fish on the reef. At the end of the dive, we see a Napoleon (humphead) wrasse nearing adulthood, with the beginning signs of the hump showing. There is also a nice sighting of a big eye emperor underneath a ledge. Our diving experiences in Kosrae have been marvelous, and the pleasure is multiplied by the many wonderful experiences we’ve had topside, including the lovely church service, great food and company at Inum Restaurant, and an excellent rainforest hike. Good bye Kosrae – a very special place for us.